"I hate bugs. Particularly mosquitoes. So this perfume began in 1992 as a bug repellant for me when I lived in the country. I knew from my research that one of the principal reasons plants produce their essential oils is to protect themselves from insects and I discovered several essential oils that were particularly effective to protect me from insects as well. The challenge then became to blend these various oils so that they truly smelled like perfume. Which, after a period of experimentation, is just what I did." Outside smells mostly like a lavender blend. I also get quite a bit of geranium and a lot of patchouli that gives the impression of freshly-turned moist earth in your kitchen garden. I can't say that Outside is a real perfume, but it is very pleasant if you're a patchouli lover who likes essential oils. I have this image of being invited to the Queen's garden party, anointing myself in Outside for protection before wearing a cute floral dress and an outrageous hat. However, once I get to meet the Queen and the Duke of Edinburgh, he unceremoniously tells me that I smell like a dirty hippie. Prince Philip would be right. I bought my sample of Outside a little over two weeks ago and have tested it several times since then. I can tell you that when I wasn't wearing it I acquired a couple of mosquito bites (including during a quick walk in Manhattan, from the car to Bergdorf). No incidents when I risked my skin wearing Outside in my bug-ridden backyard, so the repellent thing may be working. The scent doesn't project too much but a drop lasts for about 3 hours on my skin. I experimented with wearing Chanel No. 19 while having the oil on and the result wasn't unpleasant, so I guess layering is the way to go. The main issue with CB I Hate Perfume's Outside is the price. I spend as little time as possible outside so the 2ml sample will last me a while, but if I were to spring for a full bottle It would cost me $115 for the 15ml absolute or $100 for the 100ml water perfume. That's quite steep for a bug repellent, but talk to me the next time I get covered with welt-like bites. Notes: lavender, geranium, patchouli, cedarwood, bergamot and a touch of oregano. CB I Hate Perfume- Outside is available from cbihateperfume.com. If you visit the site do take note of CB's effort to raise money quickly to move his gallery (out of necessity) through an interesting benefactor plan. A "contribution" gives an added percentage of credit for future percent over what you pledge. It's not really a contribution because you get the full pledge back in credit plus the extra percentage (starting at 10% for amounts between $100-$199), which I guess makes it more of a loan, paid back with interest in good perfume. 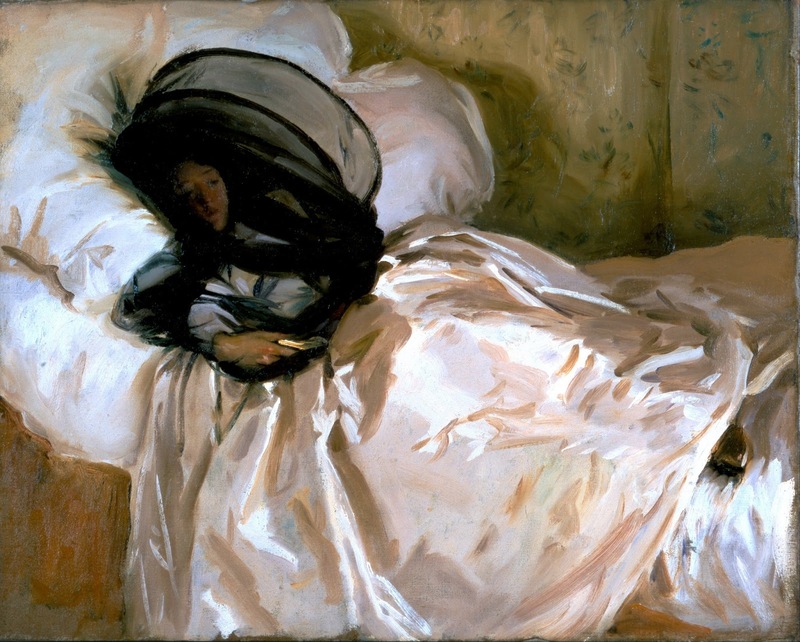 Art: John Singer Sargent- The Mosquito Net, 1908. Love his things and love that painting. There are so many that I want and now you have told of yet another. I have been concocting such things for Dante for years but he doesn't appreciate it so much, & much rather be stinky from rolling in certain spots in the grass. Have you noticed that when you wear floral scents you attract insects all the more? I can't say I let it stop me. I recall walking through a coastal swamp using Avon's Skin So Soft, which was the only thing that worked with the literal hordes of mosquitos, applying every 5 minutes. There must be something gene altering-ly poisonous in that stuff, but it does truly work.